Maruti S Cross Premia is a new variant in this model series, and it comes along with many impressive features. New features as far as the exterior goes include alloy wheels, fog lamps. The basic template of its body remains otherwise unchanged, with the same silky metallic skin and the same streamlined body format. HID headlamps are also a new ingredient in this version, and they help cement the exterior profile as well as the safety function of the car. Coming to its interior, the new edition is graced with an all new Garmin Navigation system, which comes along with a 12.7cms screen for the best working capacity of the driver. Other than this, the music system is sustained with the presence of many features, such as as USB/Aux-In facility and an audio remote control. Bluetooth facility is another prized element of the interior, for it allows for audio streaming through enabled devices and call hosting within the car. A well enforced safety function is also present for the vehicle, with a driver's side seatbelt reminder, a reverse parking sensor and a camera as well. The vehicle's outfit is slender and agile, allowing it the benefit of speed on the road along with the benefit of a thrilling look. The company has ensured that no stone is left unturned in giving it an enriched persona that is complete with dazzling chrome highlights, sleek body curvatures and many more engrossing features. The front grille has a unique shape, and there is a chrome application for a more renewed look. The emblem of the company is perched at the center of the grille, making a distinctive mark. Flanking this are sharply designed headlamp clusters, which have been integrated with all necessary lighting units for the best visibility function during the drive. Attractive cladding is present by the bottom of the front bumper, and the wide air intake section also adds to the appeal of the front. By the side, attractively designed alloy wheels wheels add charisma to the vehicle's persona, along with the pronounced wheel arches. Black roof rails are present at the top, while the body colored door handles and outside door handles make for an element of harmony in the profile. The skid plate makes for convenience in the drive, and a silver garnish is applied to it for a more opulent effect. At the rear, split rear combination lamps look good, and also aid the vehicle in fulfilling its safety requirements. The cabin has been treated for an aura of comfort and affluence, and it is also governed with precise design that ensures harmony in its limited space. There is chrome is present on the AC louver knobs, along with the door handles and the parking brake tip. The seats are comfortable in design, and rich fabric upholstery makes for an elevated luxury quality for the occupants. The door armrest ensures convenience, and it has also been dressed in fabric for a more lavish feel. Coming to the utility and comfort face, the cabin provides many vital features such as a glove box with illumination, a TFT screen for the benefit of the driver, central armrests for both rows and many more. Coming to the raw facet of the vehicle, it is powered by a DDiS 200 drivetrain, which displaces 1248cc. The plant consists of 4 cylinders and 16 valves incorporated together through the double overhead camshaft configuration. It unleashes a power of 89bhp at 4000rpm, coupled with a torque of 200Nm at 1750rpm. The company has meshed the engine with an efficient 5-speed manual transmission, which brings hassle free shifting and a better drive capacity to the vehicle. The brakes have been cemented with ventilated discs by the front and solid discs by the rear. In addition to this, a robust chassis system is also present, with a McPherson strut for the front arm and a Torsion beam rigged onto the rear. Coil springs have been compounded onto both of the axles, ensuring a smoother driving and reduced strains. Many strong features enhance comfort for the passengers, ranging from the central locking system to the keyless entry system, power windows, driver side vanity mirror and the soft touch IP. The rear seats come with a 60/40 split arrangement, enabling higher space at the rear in case of need. The manual air conditioning system imbues the cabin with a pleasant and enjoyable air. Meanwhile, the sliding front central armrest comes along with a storage box, and the rear central armrest comes along with a cup holder. An audio system that has a CD player incorporated into it brings quality entertainment to the occupants, and this is further boosted by four door speakers and steering mounted controls. A feature to be underscored is the TFT Information display, which presents the driver with vital drive statistics, and it comes along with a trip meter and a fuel consumption meter. This vehicle has been designed with a sophisticated Suzuki TECT body format, which provides a strong safety shield for the inner passengers in case of a mishap. Then, there is an anti theft security system which provides security for the vehicle as well, along with an engine immobilizer. Anti lock braking system keeps the vehicle from losing control. Then, there is a dual horn, front airbags, seatbelts with pretensioners and force limiters, a rear wiper and washer, a rear demister, an auto dimming IVRM and a rain sensing auto wiper. 1. The presence of a Garmin Navigation System is a strong bonus. 1. The absence of additional techno programs could weaken its stability. 2. Engine performance can be further improved. 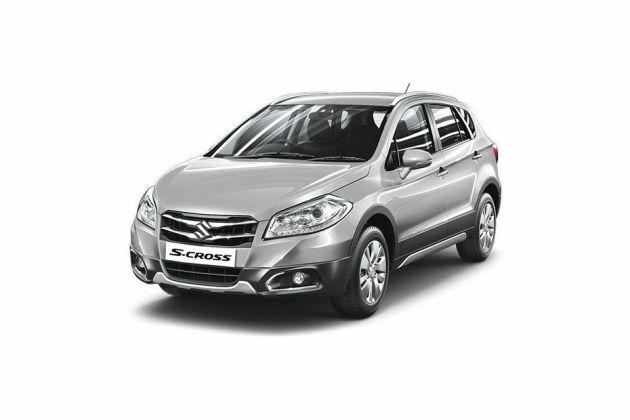 Maruti S-Cross 2015-2017 is available in 4 different colours - Caffeine Brown, Granite Grey, Urban Blue, PREMIUM SILVER. 1.3 Zeta S cross, a Diamond Car!!! Everything done perfectly except the front look!